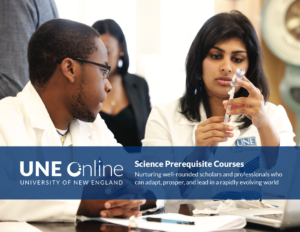 UNE Online tuition for Science Prerequisites for Health Professions courses is $360 per credit hour plus a $30 registration fee per class. Some classes have additional required course materials. Additional course material cost is not figured into the cost per credit hour. Please review the page of the course of interest for specific course cost here. Tuition can be paid using debit card, credit card (Visa, Mastercard, or Discover), or electronic check. Only one form of payment is accepted at this time. We do not provide payment plans at this time. 100% refund on or before the official start date of the course. *Please note refunds will take 3-5 business days to be credited back to the card used at the time of registration. Students utilizing private loans will need to first apply and be approved for their loan. UNE will then receive the loan notification and reach out to the student in which they will be manually registered. Students will not need to register through our registration portal if utilizing a private loan. For more information on this process, please contact our Student Financial Services office at 207-602-2342. UNE Online accepts several military benefits to be used towards our Science Prerequisites for Health Professions courses. Tuition Assistance – Please submit your Tuition Assistance paperwork to Cathy Mahan via email at cmahan@une.edu. Veterans Assistance & GI Bill® – Please submit your Veterans Assistance or GI Bill® paperwork to UNEVeteranAffairs@une.edu. For more information on utilizing one of the other options, please contact our Student Financial Services office at 207-602-2342.